(Nanowerk News) An international team of scientists from Russia and the United States, including two Department of Energy national laboratories and two universities, has discovered the newest superheavy element, element 117. Academician Yuri Oganessian, scientific leader of the Flerov Laboratory of Nuclear Reactions at JINR and spokesperson for the collaboration said, "The discovery of element 117 is the culmination of a decade-long journey to expand the periodic table and write the next chapter in heavy element research." "This is a significant breakthrough for science," LLNL director George Miller said. "The discovery of a new element provides new insight into the makeup of the universe and is a testimony to the strength of science and technology at the partner institutions." "This collaboration and the discovery of element 117 demonstrates the fundamental importance of scientists from different nations and institutions working together to address complex scientific challenges," ORNL Director Thom Mason said. The two-year experimental campaign began at the High Flux Isotope Reactor in Oak Ridge with a 250-day irradiation in the world's most intense neutron flux to produce 22 mg of berkelium. This was followed by 90 days of processing at Oak Ridge to separate and purify the berkelium, target preparation at Dimitrovgrad, 150 days of bombardment at one of the world's most powerful heavy ion accelerators at Dubna, data analysis at Livermore and Dubna, and assessment and review of the results by the team. 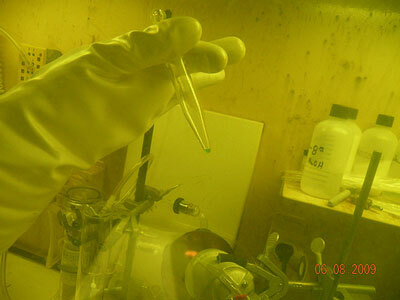 The entire process was driven by the 320-day half-life of the berkelium target material. The experiment produced six atoms of element 117. For each atom, the team observed the alpha decay from element 117 to 115 to 113 and so on until the nucleus fissioned, splitting into two lighter elements. In total, 11 new "neutron-rich" isotopes were produced, bringing researchers closer to the presumed "island of stability" of superheavy elements. "It fills in the gap and gets us incrementally closer than element 116--on the edge," said Ken Moody, one of the LLNL collaborators and a long term veteran of superheavy element research. "The experiments are getting harder, but then I thought we were done 20 years ago." "These new elements expand our understanding of the universe and provide important tests of nuclear theories," said Vanderbilt University Professor of physics Joe Hamilton. "The existence of the island of stability, a pure theoretical notion in the 1960s, offers the possibility of further expansion of the periodic table with accompanying scientific breakthroughs in the physics and chemistry of the heaviest elements."